Home » How-To Library » What to Do About Weeds and Dandelions? Your lawn looks perfect. Then you spot a dandelion. Even the most immaculately manicured lawns have bouts with weeds and dandelions. So what do you do when you see one on your lawn, and how do you prevent more from sprouting? Once you discover weeds on your lawn, you have three possible ways to approach the situation. It’s easy. You just yank it out of the ground, right? Well, not exactly. Although angry homeowners often pull dandelions out of the ground, this method often does not kill the weed. In order to truly eradicate your dandelion problem, you must remove the entire taproot. Many stores sell special “dandelion pullers” that can help you hand dig and remove the taproot. Ideally, hand digging should be done in the spring when the first dandelion seedlings appear. This way you can remove the problematic weeds before their seed can spread. 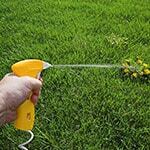 Broadleaf herbicide—this herbicide focuses exclusively on killing broadleaf weeds, like dandelions. Fortunately, it also won’t kill your grass. Non-selective herbicide—this is the nuclear option. It will kill any plant that it touches. A lot of common store brands are non-selective herbicides. What if you want to avoid using chemicals while also saving yourself the hand-wringing work of digging? 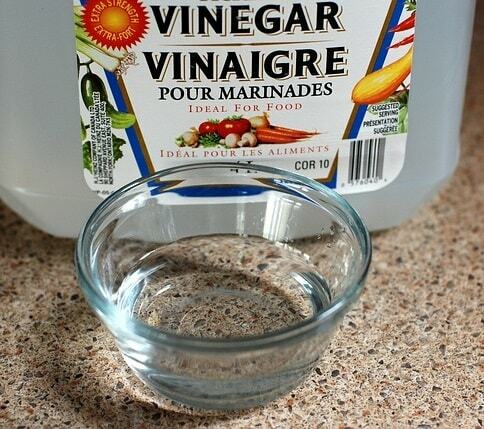 Put this solution into a spray bottle and you’re ready to attack the weeds. If you don’t want to try that option, there are other organic weed control products on the market that can be helpful without leaving a chemical residue in their wake. The steps above will help you kill weeds. But how do you prevent them from camping out on your lawn in the first place? To keep your lawn lush and weed-free, you need to focus on the fundamentals. 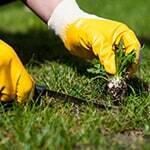 Fertilize your lawn regularly, use a turf builder solution, or explore a crabgrass preventer. Mowing your lawn at the proper height, usually 2 1/2" to 3"
Apply these tips, and you’re bound to have a weed-free yard in no time. What to Do About Weeds and Dandelions?.. Our Power Equipment Direct how-to library can help you learn about How to Fertilize Your Lawn, Vote for Your Favorite Brands in Mower Madness 2019 and Official Mower Madness Contest Rules.